eCite - Which is the safest NSAID for patients at elevated cardiovascular risk? Which is the safest NSAID for patients at elevated cardiovascular risk? 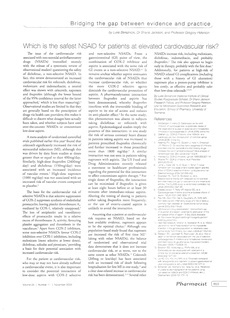 The issue of the cardiovascular risk associated with non-steroidal antiinflammatory drugs (NSAIDs) intensified recenty with the release of a systematic review of observational studies questioning the safety of diclofenac, a non-selective NSAID. In fact, this review demonstrated an increased cardiovascular risk for rofecoxib, diclofenac, meloxicam and indomethacin; a neutral effect was shown with celecoxib, naproxen and ibuprofen (although the lower bound of the 95% confidence interval for the latter approached, which is less than reassuring). Observational studies are limited in that they are generally based on the prescription of drugs via health care providers; this makes it difficult to discern what dosages have actually been taken, and whether subjects have used over-the-counter NSAIDs or concomitant low-dose aspirin.